iCloud Drive in OS X Yosemite can easily and safely store all your spreadsheets, PDF images, presentation and any document to your iCloud. To upload your documents to iCloud, drag your document into the iCloud Drive folder in your Mac OS X Yosemite. To access your newly created document in separate folder can be share on another iOS 8 running devices. As an advance feature you can edit document on any format files (PDF, DOC, etc..) without downloading in your device. You can open and work on the same file across multiple apps that support iCloud drive. Useful: How to secure your iCloud account more protect. There are two way to access iCloud Drive in OS X Yosemite. Please follow the given bellow step. Step 2: Go to the Favorite Section then select iCloud Drive option. Alternatively you can also find iCloud Drive in Mac OS X Yosemite using bellow step. 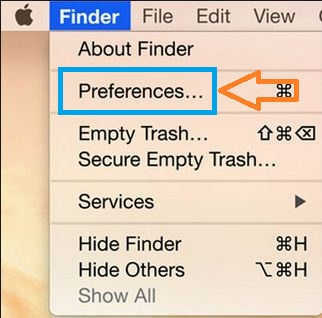 Step 1: Go to Finder from top menu in your Mac desktop. Step 4: inside the Favorite, click iCloud Drive and open it. In right side of the windows you can see different files or documents such as Keynote, TextEdit, Numbers and My folder etc. Using iCloud Drive in OS X Yosemite you can upload and access anything you want up to 5GB free storage, to store your files, Media and documents in iCloud Drive. iCloud also use for Synchronize information like as back up photos, contact and iPhone restore. iCloud in iPhone: How to disable or enable iCloud drive in iPhone – iOS 8.
iCloud Drive in OS X Yosemite is best for easy access files to your different Mac. If you have any other method or idea for sharing document using iCloud Drive then please share with us and comment bellow.